Apple’s new MacBook Pro with Retina display is probably the least repairable laptop so far, according to repair site iFixit. Just a couple of days after it became available, the teardown of the Retina MacBook Pro shows the notebook is a great piece of engineering, but this comes at a price. If you take an iPhone or iPad to the Genius Bar at an Apple Store to get it repaired, instead of tearing it open and fixing the problem, they will most likely replace your faulty device with a newly refurbished counterpart. This hasn’t been the case with Mac laptops so far, but it could well be from now on, given the design compromises Apple had to make in order to build the slim Retina MacBook Pro. 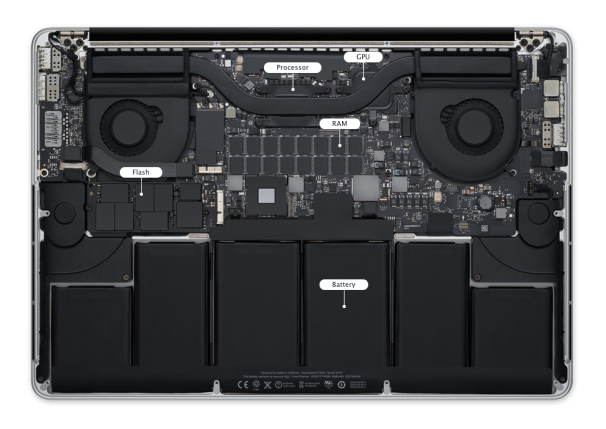 The teardown from iFixit shows the RAM in the Retina MacBook Pro is soldered to the logic board, which means that you won’t be able to freely upgrade the memory from less expensive third-parties. This also means that you will be stuck with the amount of RAM you have from the initial purchase. So far so good though, as the new notebook comes with 8GB of RAM as standard, upgradeable to 16GB for $200. The Retina MacBook Pro also uses Apple’s proprietary pentalobe screws. Meanwhile, the battery takes up a large part of the inside of the laptop, which has 95 Wh at 10.95 V compared to last year's 77.5 Wh battery. The problem is that the battery is not screwed into the machine anymore. Instead, it is glued on, making it difficult to replace. There’s also the 220ppi Retina display itself, which is fused with the bezel, meaning that it would need to be replaced in its entirety if anything goes wrong. Add to that the fact that proprietary Flash memory is used in the Retina MacBook Pro, and you’ve got yourself a virtually irreparable $2,200 laptop that should only be fixed by Apple’s Genius Bar.